These are high quality urethane domed decals to replace the current BRP logos with the Lamonster logo created for Lamonster. Made to automotive grade specs these decals should have a lifespan of 6 to 20 years. 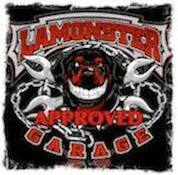 After the stock decal is removed simply clean any residue from old decal area and apply your new Lamonster logo.